Confidently prepare for the challenges of modern maternal-newborn and child health care nursing. 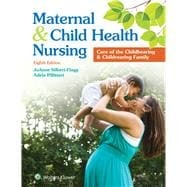 A respected authority revised for today’s changing health care environment, Maternal & Child Health Nursing, 8th Edition presents maternal-newborn and child health care not as two separate disciplines, but as a continuum of knowledge. Using a nursing process framework, this proven text applies a clear, easy-to-understand approach and wide range of built-in learning aids to help you master essential concepts and skills for success in this ever-changing and increasingly important field. Dr. Joanne Silbert-Flagg has been a practicing Pediatric Nurse Practitioner for over 30 years in a pediatric primary care practice. She has been a Board Certified Lactation Consultant for 10 years in both a pediatric primary care setting and in a hospital setting. Since joining Johns Hopkins University in 2000 she has been an instructor and course coordinator in multiple undergraduate and graduate pediatric and maternal child theory and clinical courses.